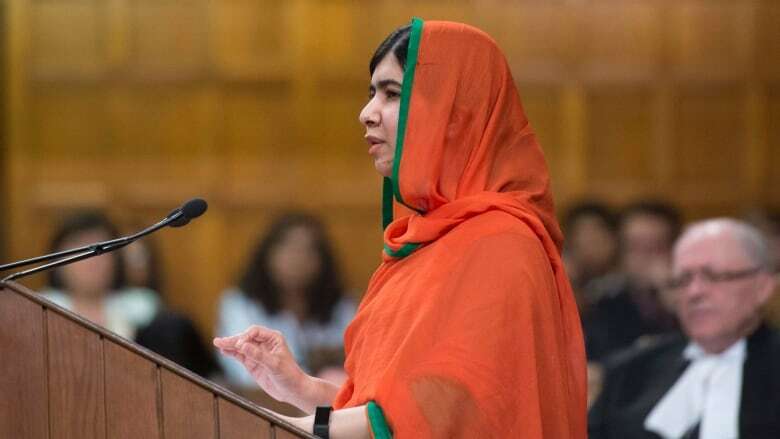 Malala Yousafzai's appearance in the House of Commons Wednesday was another occasion to recognise Canada's best intentions. And a reminder of how much more this country might do to lead the world. Such is Canada's current brand that the occasion of an internationally acclaimed activist's address to Parliament should include references to the prime minister's yoga abilities and tattoos. "When I was coming here, everyone was telling me, like, 'Shake the prime minister's hand and let us know how he looks in reality,'" said 19-year-old Malala Yousafzai, deviating from her prepared text and drawing laughter from the assembled dignitaries and guests. "And people were just so excited about meeting Trudeau. I don't think anyone cared about the Canadian honorary citizenship." Seated together in the centre aisle of the House of Commons, Justin Trudeau and Sophie Grégoire Trudeau both laughed and sheepishly put their hands to their foreheads. It is an accident of history that Yousafzai came to meet Prime Minister Trudeau. If not for the attack on Parliament Hill in October 2014, she would have accepted her honorary citizenship from Stephen Harper, who actually asked Parliament to bestow the honour a day before the shooting rampage. But her appearance on Wednesday was another occasion to recognize Canada's best intentions and recently celebrated actions. And a reminder of how much more this country might do to lead the world. Yousafzai praised the unity Canadians have shown in the wake of both the October 2014 attack and January's deadly shooting at a mosque in Quebec — a multicultural commitment that is exemplified, she said, by this country's welcoming of refugees. "Your motto and your stand, 'Welcome to Canada,' is more than a headline or a hashtag," said Yousafzai, who was shot by a Taliban gunman in 2012 after she gained attention as an advocate for girls' education in Pakistan. "It is the spirit of humanity that every single one of us would yearn for if our family was in crisis. "I pray that you continue to open your homes and your hearts to the world's most defenceless children and families and I hope your neighbours will follow your example." Seated directly to Yousafzai's left was KellieLeitch, the Conservative leadership candidate who has come to prominence with her proposal that all visitors to Canada be screened to ensure their commitment to this country's values. Setting aside questions about the practicality or wisdom of such a policy, to propose it is to suggest Canadian values are faced with some threat from newcomers. And that Leitch would embrace the policy suggests there is some existing public concern she hopes to harness. That much doesn't mean Canada is unworthy of Yousafzai's praise. But it does suggest that brand of Canadian tolerance isn't quite unanimously embraced or absolute. Much thus depends, both domestically and internationally, on the success of Canadian resettlement and integration efforts; not only welcoming refugees and immigrants, but ensuring they succeed. In the past six months, public attention has also turned to the phenomenon of illegal border crossings from the United States, an issue Leitch tweeted about less than two hours before she took a front-row seat to listen to Yousafzai. If the Trudeau government is successful at integrating newcomers and minimizing the grounds for public angst, Canada might persist as the sort of model that it is sometimes made out to be. It might even continue to welcome more and more new Canadians each year. But that would still leave questions about what Canada is doing to more directly shape the world beyond its borders. Just a day before Yousafzai addressed Parliament, the Organization for Economic Co-operation and Development released a report on global development aid that found Canada's contribution decreased slightly in 2016. Canada contributed approximately $4 billion, but as a share of gross national income it still lagged below the OECD average and was well short of the international target of 0.7 per cent. Development Minister Marie-Claude Bibeau says the development community seeks not only money, but also leadership and effective policy. She can point to her government's work to help raise $13 billion for the Global Fund last fall. And a new development strategy is due to be unveiled soon. But more aid money would certainly bolster Canada's claim to leadership. Missing too, for now, is any follow-through on the signature Liberal commitment to pursue new peacekeeping opportunities. And perhaps, while Canada is trying to meet its own climate targets, the Trudeau government can convince its friends in Donald Trump's administration to at least refrain from officially pulling the U.S. out of the Paris accord. Yousafzai followed her praise with a few requests. "Dear Canada, I am asking you to lead once again," she said. Girls' education should be a central theme of Canada's G7 presidency in 2018, she said. Canada should use its influence to "fill the global education funding gap" and raise new funds to help girls go to school. And the government should prioritize ensuring that refugees can access post-secondary education. Later, during question period, Elizabeth May would put these ideas directly to the prime minister and he would at least suggest some interest in pursuing them. "If Canada leads," Yousafzai had said, "I know the world will follow." The tattoos and yoga poses might help draw global attention. The extent of Canadian leadership will depend on what else the world sees.